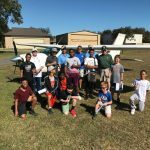 Please call our Young Eagles Coordinator to find out how you or your group can get involved and participate in an upcoming Flight Experience in our area. Young Eagles® Visit the official EAA Young Eagles website for full details about this exciting youth program. Latest News about EAA983 Young Eagles® . . .